Aloha has many meanings –hello, goodbye, love and kindness. We’ve taken the spirit of the word and conveyed it through a special way to show your “aloha,” a gift that will grow throughout the years. 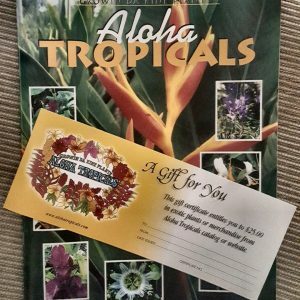 Purchase Aloha Tropicals gift certificates. They are the ultimate gift for any special occasion –birthdays, anniversaries, Christmas, Valentine day, Mother’s Day, Father’s Day, graduations or just send your “aloha” to that special person. With each certificate comes a color catalog with a great selection to satisfy anyone. Gift certificates are available in denominations of $25.00 U.S. which includes shipping and California sales tax (CA residents only). Gift certificates make excellent gifts! Give that unique and affordable gift that says “aloha” with exotic tropicals from Aloha Tropicals.